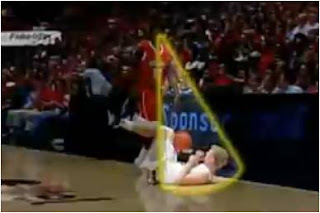 Was Tom Penders Right About ESPN Doctoring the Chase Budinger Video? ESPN does add a spot shadow to show Aubrey looking down, which as I mentioned in a Previous Post is debatable. The intention is there nonetheless. Plus the ESPN announcer says, "He wasn't looking down at him, but it was foot on top of head" two seconds after the alleged X-Ray vision clip shown above. There you have it. It appears Penders isn't as crazy as we thought. ESPN really did give Aubrey Coleman X-Ray vision in an earlier version and then took it out. 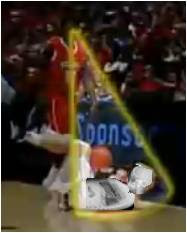 Maybe he's right about Aubrey not intentionally stepping on Chase after all.